The sixth main-stage concert in the Music@Menlo festival centered on the music of Budapest, the center of Hungarian culture. Held July 31 at the Center for Performing Arts at Menlo-Atherton, this program featured four composers who drew from the folk music of Hungary. 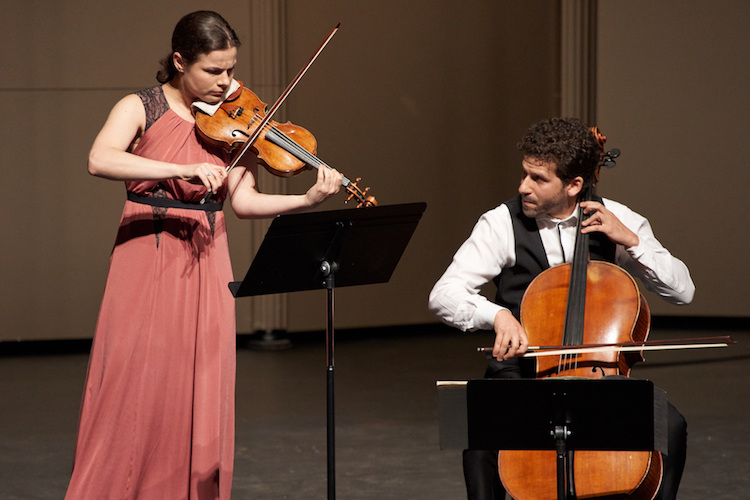 Bella Hristova and Nicholas Canellakis, two rising stars of the string world, opened the concert with Zoltán Kodály’s Duo for Violin and Cello. Combining modernist impulses and Magyar scales, this is a difficult work. But hearing these two extraordinary musicians perform this made it come to life, as accessible as it was contradictory. Bella Hristova and Nicholas Canellakis; photo by Geoff Sheil. Kodály spent his life exploring the ethnomusicology of Hungary, and this work drew on those village melodies and feelings. Huge attacks became a metaphor for the sturdy pride of the peasants, while fragile melodies drew us down into a simpler and richer way of life. I’m not sure those folk musicians would entirely approve of how their themes and traditions were rebooted into the modernist gestures of the early twentieth century. But they would have enjoyed the proud and competitive spirit of the violin and cello, each theme a challenge. And then in the Adagio we found the melancholy of a hard life, with sonorous cello notes limned with cool violin arpeggios. Hristova took her own turn, soulful notes descending like tears over a graveled river bed of cello. The cello began to scrub the bottom, and violin wailed, and suddenly they were modern and atonal, brusque and dissonant. They returned to passion for the last movement, from majestic to blistering (and it is titled “Maestoso e largamente, ma non troppo lento – Presto”), and this was the whole package: velvety tones, fiery virtuosity, melting harmonies, and even a dance. The audience stood to applaud that consummate fire, which is rarely done after the first piece (more often people stand up if there is an intermission coming so they can rush for the drinks and bathrooms). But then the Bartók!! The Calidore String Quartet, this season’s Music@Menlo “house band,” again brought a sophisticated audience to their feet with their flawless performance and emotional immediacy in Béla Bartók’s String Quartet No. 5. A life-long friend of Kodály, Bartók also elevated the voice of the common people, using their minor scales, proud declamations and sly forms and coupling that to the evolving musical forms of the early twentieth century. The Calidore brought a Big Presence and tightly timed performance, the hallmarks of practice and patience and more practice and impatience. Filled with repeated notes and ancient rhythms, here was a language that broke many of the rules of classical. It was not sweetly lilting, like Mozart’s classical, nor thick with emotion like Schumann’s romanticism, but idiosyncratic and energetic and self-aware, angular with sudden dissonances and sharp attacks and wheezing harmonies. This established a bitter ground etched with high violin. And like the Magyar language, this musical language had its own rules that seemed like Romance languages spoken backwards. The strings ran up the scales in a rush and then sat in sullen softness. Attacks were front-loaded with belligerent accents, notes repeated in changing clusters of secret dots and dashes. And the dialogues were halfway talking, halfway fighting, and fiercely heart. Written in 1934, one was instantly reminded of Shostakovich’s later String Quartet No. 8, with its menacing “knock on the door” and even a signature four-note motif. The slow movement wheezed in on odd harmonies and soft trills, then rose to thin high notes and low curses. And then they returned to restless energy, indistinct mutters and mocking children’s song, the bounty and hardness of ancient lands. Bella Hristova returned, along with violinist Wu Jie, for a sentimental duet by Geörgy Ligeti, a composer better known for his electronic experiments and softly shifting clouds of sound. But his yearning Ballad and Dance made me homesick for some mythical Old Country – even though I was raised in the Midwest! Hristova took the higher line while Jie played soft chords, as clean and universal as a Gregorian chant. And then they bounced into a rousing dance. The program topped off with a passionately romantic Sextet in C Major by Ernö Dohnányi, with a careful balance of the colors of string, piano and winds. Anthony McGill played the clarinet line with cool runs and wistful humor, and Kevin Rivard added the mournful call of French horn. Violin, viola and cello made for full octaves of strings, and Gilles Vonsattel completed that balance with rippling piano work. Dohnányi was a piano prodigy, and that piano score was demanding, but Vonsattel kept a light clarity to his runs and romps. They shifted into a stately march, and it was hard to tell if this was a march to the gallows or to the altar. But rooted in Hungarian idioms, maybe there was some overlap! And then back to turns of torrid and lively, each instrument shining brightly and carefully woven into the others. These six performers were a dream team, and the audience stood in ovation once again. This summer festival ended with a trip to one more capital, Vienna. It is over for now, but many events were recorded and can be heard though their website. Look for the Livestream link at musicatmenlo.org for almost thirty Prelude Performances and Master Classes. Photo top of Bella Hristova and Nicholas Canellakis. 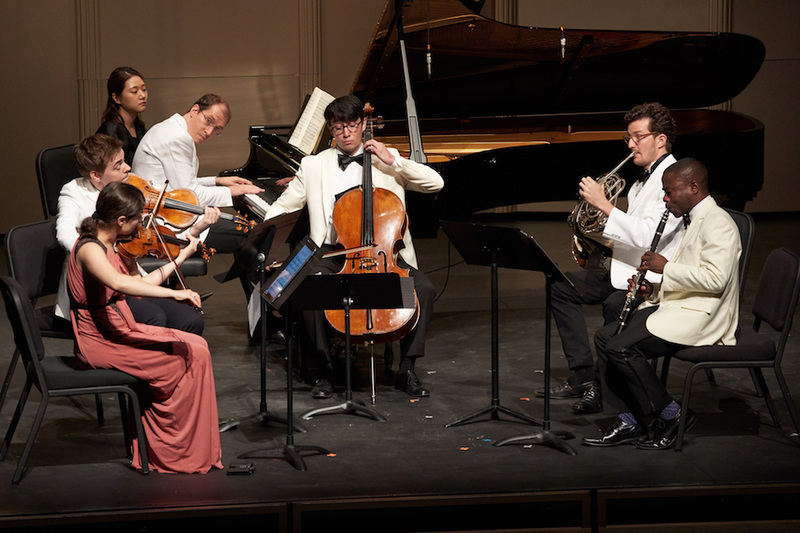 Below, from left front: violinist Bella Hristova, behind her, violist Matthew Lipman, pianist Gilles Vonsattel, cellist David Requiro, Kevin Rivard on French horn, and Anthony McGill on clarinet; both photos by Geoff Sheil.